Dampness of one sort or another is the most common problem in housing. It results in visible wetting of walls, ceilings and floors, blistering paint, bulging plaster, sulfate attack on brickwork and mould on surfaces and fabrics, usually accompanied by a musty smell. It can also lead to less obvious problems, eg thermal insulation is reduced in effectiveness or brickwork cracks because metal components embedded in it have corroded. 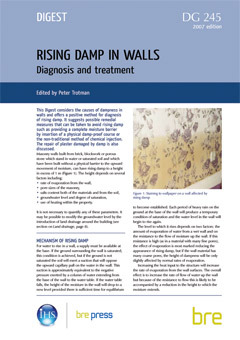 As with all repair work, the first step to solving any damp-related problem is to diagnose the cause correctly. 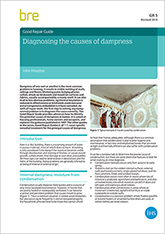 This Good Repair Guide provides advice on how to identify the potential cause of dampness in homes. It is aimed at housing professionals, home owners and occupiers, and replaces the guidance published in 1997. The other guides in the series, Good Repair Guides 6–8, cover specific remedial treatment for the principal causes of dampness.